To compost yard debris, you don’t need any special skills or even equipment. But, you do need a bit of patience and some basic materials. 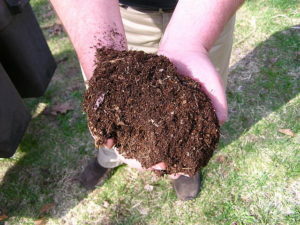 With just a little bit of effort, you can compost yard debris to feed your flower or vegetable garden a healthy diet. When you opt to compost yard debris, you’re doing two things at once. First of all, you’re forgoing dipping into your wallet for costly fertilizer products. And, you’re also effectively dealing with all that neverending organic yard waste. So, you’re getting two big benefits with just one simple action. Plus, you’ll discover what best works over time, which is even better news. Build a big organic pile. Don’t think you need to start small, because that isn’t the case. In fact, the bigger the better. (Although it presents a little more effort, it’s definitely necessary.) Leaves, branches, grass clippings, fruits, vegetables, coffee grounds, sawdust, paper, and more are all prime candidates. Water it sparsely occasionally. Once you have a pile that’s at least three feet tall and not too spread out, you’ll need to add a little water here and there. Don’t soak the pile though. That causes microorganisms to drown and that’s a bad thing. Use a thermometer to check the center of the pile, which should range from 130 to 150 degree Fahrenheit. Oxygenate it by turning it over. Use a garden fork or pitchfork to turn the pile from time to time. Otherwise, the pile will only rot and that’s completely counterproductive to your goal. Regularly check for signs of rot. Always be on the lookout for rot. If you see any signs of the pile rotting, something is definitely wrong. It should become brown, dry, and will easily crumble. If you need yard debris cleanup, just phone 800-433-1094 or visit Junk Garbage Removal.